Match keeps growing as the biggest player in the dating industry and has just added a crowned jewel to their portfolio. 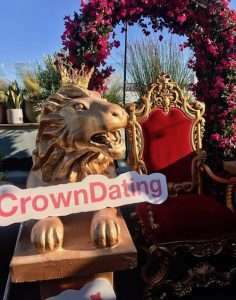 At a swanky West Hollywood rooftop party, the Match team came to celebrate their new dating-game app, Crown, starting in the Los Angeles market. How Crown works is, instead of swiping on one potential date at a time as you would on Tinder or Bumble, users are presented with 16 matches every day at noon, with two profiles on the screen at one time. Once you “crown” or select your favorite of the two, you continue in pairs until the first round is over. The players or potential dates then move into the second round of eight, where once again you can view and select one of the two until you eventually reach the final four, where you officially have the opportunity to chat with those from the four profiles you’ve crowned. Does it sound like March Madness? Well, it’s similar, but the end-game is to find one to four matches to strike up a chat with and hopefully meet IRL. I asked Match Group’s VP, Andy Chen, why he thinks gamification is a great way to find a date. Chen flew to Los Angeles from the Match HQ with other executives, as well as the app’s creator, Patricia Parker from the Match products and events teams. “I met my husband on Match, so initially I was trying to think of dating things that were overwhelming for me,” says Parker. Chen tells me that people are craving a more focused and curated online dating experience. “We also find that choosing between two users is an easier and more fun approach than swiping through endless profiles,” says Chen. If you’re tired of swiping right and left on mobile dating apps, I believe this new dating game app launched by Match may help soothe the brain and fill up your date cards with quality matches. Crown wants singles to have a more focused experience; long enough for them to discover new people but short enough to avoid the fatigue that singles struggle with, and to leave just enough anticipation for the next day’s batch of matches. If you’re Gen Z or Millennial in the Los Angeles area, you can download the Crown app on iOs HERE. Julie Spira is America’s Top Online Dating Expert and Digital Matchmaker. She’s the CEO of Cyber-Dating Expert, and has been coaching singles on finding love online for almost 25 years.